In 1901, engineer John Wilkinson built a small car with an air cooled engine, but unfortunately failed to sell his brain-child. Just as he had almost given the whole thing up, however, he met Herbert H. Franklin. Franklin was so impressed by the design that he convinced Wilkinson to produce the cars under the name Franklin. In 1902, the first car produced under this name was sold. After this, sales figures climbed steadily. In 1906, Franklin introduced the first model with a six cylinder engine, and these too sold well. Until 1928, all Franklins still had a wooden chassis. This was replaced by steel in 1929. 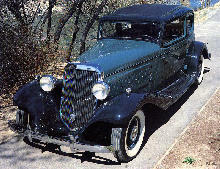 Due to the impact of the world crisis, less than 2,000 cars were produced in 1932. 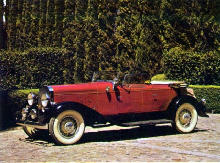 In 1933, the make introduced a car with a V12 engine, the sedan version of which cost $3,885. Even this design, however, was unable to stave off disaster. All the cars had to be sold at a loss, and the banks quickly choked off the money supply. The company closed its doors for good in 1934. In an era when most American automobiles were virtually indistinguishable with a single or two-cylinder water-cooled engine mounted under the floor, planetary transmission, central-chain drive, and channel-section chassis, the Franklin was refreshingly different. Designed by Cornell engineering graduate John Wilkinson and manufactured by Herbert H Franklin of Syracuse New York, the cars had a vertical four-cylinder air-cooled engine with overhead valves and this was set transversely at the front of a wooden chassis, although the rest of the car followed the standard formula. The Franklin concept was copied for the early models of both Marion and Premier of Indianapolis. Transverse-engine Franklins continued into 1906 with the first of the in-line engined models appearing for 1905. Air-cooling persisted throughout the life of the Franklin automobile and the wooden chassis was only abandoned in 1928. The make was a victim of the depression years but several former staff formed Aircooled Motors Ltd to make lightweight horizontally-opposed four and six-cylinder engines that into the 1970s powered numerous helicopters.